Guest access in Office 365 Groups lets you and your team collaborate with people from outside your organization by granting them access to group conversations, files, calendar invitations, and the group notebook. Access can be granted to a guest—for example, a partner, vendor, supplier, or consultant—by any group owner. People using Office 365 Groups can use Outlook on the web or Outlook 2016 to add and manage guests in their Office 365 groups. Guests can have any email address, and their email account can be a work, personal, or school account. Note: Guest access is set up by the IT administrator. Step 1 A group owner adds a guest to the group or a guest is nominated by a group member. The group owner approves the nominees. Step 2 The group owner is informed of which content and resources the guest can access within the group. A combination of text and icons gives all group members a clear indication of guest participation. Step 3 The guest receives a welcome email and can participate in group conversations, receive and respond to calendar invitations, and access the group files. Step 4 Guests can leave the group at any time via a link in the footer of all group email messages and calendar invitations. Admins can manage guests and their access to Office 365 group resources using PowerShell. See Manage guest access in Office 365 Groups for instructions. When a guest is invited to join a group, they receive a welcome email message that includes a little information about the group and what they can expect now that they're a member. All of the guest member's interactions occur through their email inbox. They can't access the group site but can receive calendar invitations, participate in email conversations, and, if the admin has turned on the setting, they can open shared files using a link or attachment. The following table summarizes what guests can and can't do. A guest is someone who is not an employee, student, or member of your organization. They don't have a work or school account within your organization. Can I add people within my organization who are not part of the group as a guest? No. Only people who are outside of your organization, such as partners or consultants, can be added as guests. You can invite people from within your organization to join as regular group members. Can I add external mail contacts to groups? Yes, you can. External mail contacts are contacts listed in your organization's's global address list. An example of this type of contact is a vendor company who regularly provides services to your organization. When I try to add a guest to my group I get a messages that says "Contact your administrator." Why? Your administrator must turn on the guest feature before you can add guests. When you see the message to contact your administrator, it's likely that the guest feature hasn't been turned on yet. See Manage guest access in Office 365 Groups for more information. Can guests view IRM messages? Guest members can't view messages that are protected with Information Rights Management (IRM). Why do I get a non-delivery report when replying to a group message? You might get a non-delivery report when you reply to a group message with an email address that's different from the one you used when you joined or were added to the group. For example, if you joined the group as seanc@contoso.com but try replying to a group message in your inbox from seanc@service.contoso.com, you'll receive a non-delivery report. Can I share a group file with someone from outside my organization who isn't a member of the group? No. 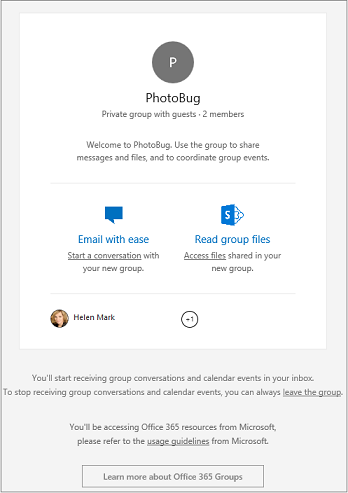 You can only share Office 365 group files with guests who have been invited to join the group. Can guests access modern attachments that were forwarded in a group message? A modern attachment is a file stored on OneDrive for Business. One link goes to all recipients. Because the file is stored in the cloud, all recipients can read and edit the file without having to reconcile individual copies. In an Office 365 group, modern attachments are only shared with members of the group. When a message with a modern attachment is forwarded to a guest member in the group, he or she will be able to access the attachment after signing in with a user name and password. If the message is forwarded to someone who isn't a member of the group, that person won't be able to open the attachment. Why are some guests missing group conversations? Guests might not receive group conversations for several reasons. See Guest users aren't receiving Group conversation for information.